In 1943 Joe McCarthy had kept all his Yankees players on the bench. But for this game, McCarthy, managing the American League for the seventh time, started two of the three Yanks on the team, including the battery of right-hander Hank Borowy and veteran catcher Rollie Hemsley. Borowy, the ninth Yankee pitcher to start in the 12 games played, was one of eight American Leaguers chosen as All-Stars for the first time. Borowy held the National League scoreless for three innings, and his second-inning single off National League starter Bucky Walters drove in Cleveland’s Ken Keltner with the American League’s lone run. Boston’s Tex Hughson, who at 13-3 had the best won-lost record on the American League staff, replaced Borowy in the fourth. Hughson had pitched a few innings in a game against Cleveland on Sunday; nevertheless, the “two-day rule,” which said a pitcher couldn’t pitch two days before the Tuesday All-Star Game, had been waived this year. Hughson retired the side in order in the fourth, but the NL erased the 1-0 American League lead by scoring four runs against him in the fifth, on their way to a 7-1 victory. Bill Nicholson drove in the first run and later scored when Augie Galan’s groundball took a bad hop off shortstop Vern Stephens’s glove for a single. The Nationals loaded the bases when Hughson walked Phil Cavarretta, and first baseman George McQuinn dropped Bobby Doerr’s throw of a Stan Musial groundball. Walker Cooper’s single scored Galan, but left fielder Bob Johnson’s throw to catcher Frankie Hayes cut down Cavarretta at the plate. It was the second time in the game that Cavarretta had been out trying to score. The National Leaguers protested the call by American League umpire Cal Hubbard, to no avail. When play resumed, Dixie Walker singled Musial home with the fourth run of the inning. The NL’s most productive inning to date delighted the overwhelmingly pro-National League crowd on a sweltering night. It was just the fourth win for the Nationals, although their six-run margin of victory did set a new standard, exceeding the five-run edge the Americans had in their 8-3 win at Washington in 1937. The National Leaguers added two more runs in the seventh against Detroit’s Hal Newhouser, when the Cardinals’ Whitey Kurowski doubled home Cavarretta and Cooper. Newhouser was touched for a final run in the eighth, albeit an unearned one. He struck out Marty Marion to open the inning, but when Hayes mishandled the third strike, Marion reached first base. Evidently NL manager Billy Southworth felt a five-run lead with one inning to go was not enough, and he had pinch-hitter Joe Medwick sacrifice Marion to second. Walks to Galan and Cavarretta loaded the bases, and Musial's long fly ball scored Marion. This would be the final All-Star appearance for Medwick, who had been selected in ten of the 12 games. It was also the final All-Star appearance for Mel Ott, who had pinch-hit earlier and had been selected in 11 of the 12 games. The National League also lost its backup shortstop when Cincinnati's Eddie Miller withdrew the day before the game because of a sore shoulder. Pirates infielder Pete Coscarart was Southworth’s first choice to replace Miller; when no one could locate Coscarart, who was off on a fishing trip, Southworth selected Pittsburgh shortstop Frankie Zak, a rookie batting .305. While the National League was adding to its lead, Pittsburgh’s Rip Sewell and Jim Tobin were completely shutting down the American League batters. Sewell faced only nine men in his three innings. Bob Johnson, whom he walked, was erased when Keltner hit into a double play. Tobin, a knuckleballer, pitched a perfect ninth. Sewell further entertained the home crowd by throwing three of his famous blooper pitches. Hubbard called one a ball and one a strike, while on the third, McQuinn, attempting to bunt for a hit, was thrown out on a fine play by catcher Cooper. 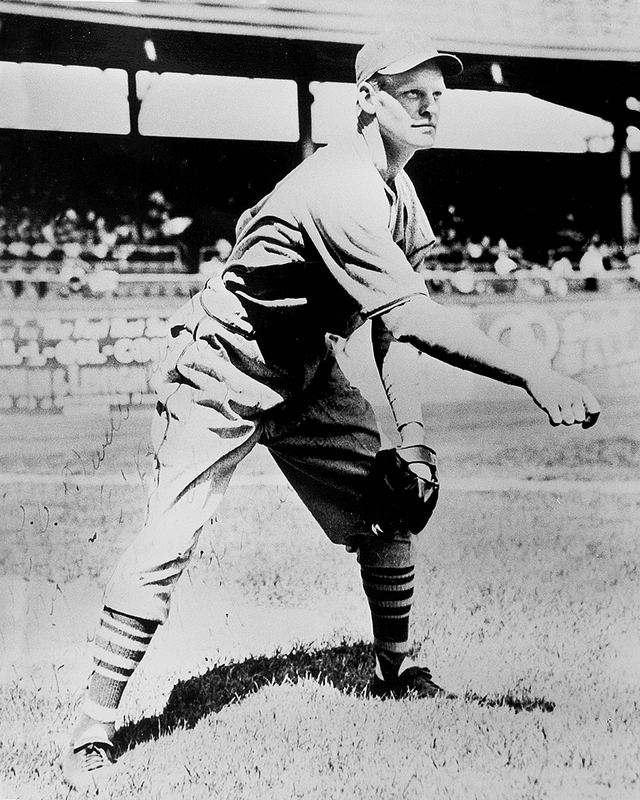 Phillies left-hander Ken Raffensberger, who pitched scoreless innings in the fourth and fifth, was the winning pitcher. Attendance for the 9 P.M. contest was 29,589, well under the Forbes Field capacity of 40,000. Pirates officials had expected a much larger crowd for Pittsburgh's biggest baseball event since the 1927 World Series. Still, the Army and Navy's Bat and Ball Fund, which supplied baseball equipment to servicemen, received $81,275 from the gate receipts, plus $25,000 from the Gillette Safety Razor Company for the radio rights, and also a donation from Sportservice, the concessionaire. Even sportswriters and club officials were asked to pay the admission price, which, as it had been for all the wartime All-Star games, was double the usual price. 1 Southworth’s and Cronin’s remarks were reported in “Southworth Gives Praise to Players,” New York Times, July 12, 1944.